The seagulls accompanied us to Martha’s Vineyard, flying alongside the ferry as it cut through waters like F-15’s guiding in Air Force One. (Or waiting for dropped potato chips.) Our children did not accompany us. They boycotted the Martha’s Vineyard excursion (and its miles of bike riding) in favor of “rest” at home today (aka watching a Harry Potter Marathon). Knowing they would be in J.K. Rowling’s good care, we acquiesced. The last time we left our kids alone watching Harry Potter was 4 years ago. We were at a rented cottage in New Hampshire, and we were only 20 yards away on the dock looking at stars. In the quiet night, we heard blood-curdling screams. We ran to the house, and through tears the kids explained that a giant snake in the movie had leaped out, causing them to jump and knock heads, the source of the screaming. Much has changed since then. They are now old enough for us to say, “Yes, you may stay home. Here’s money, here’s a map of the 1-mile walk to get food and play mini-golf. We’ll see you in six hours.” This is a happy example of “time passing” — it can be a good thing, a fact I don’t admit to often enough. 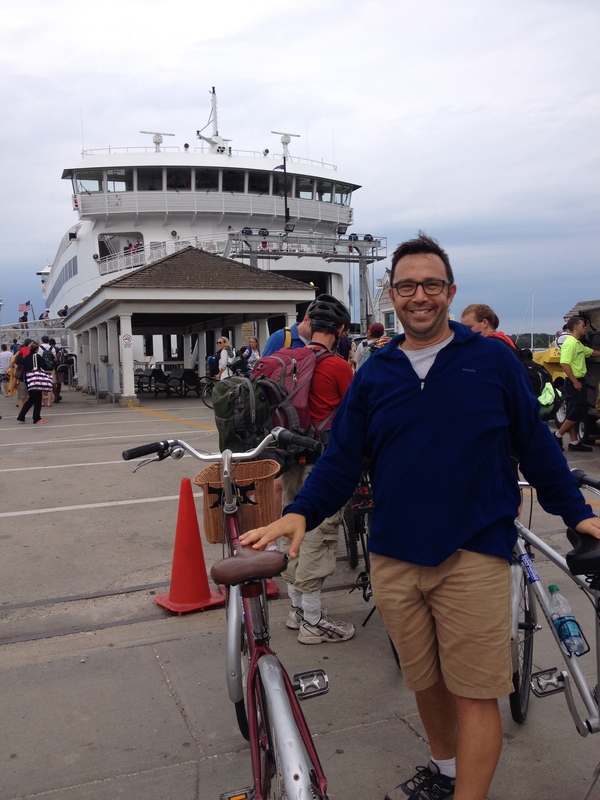 In Martha’s Vineyard, we rode bikes six miles along an ocean trail to Edgartown, where we ate lobster and drank local blueberry beer. 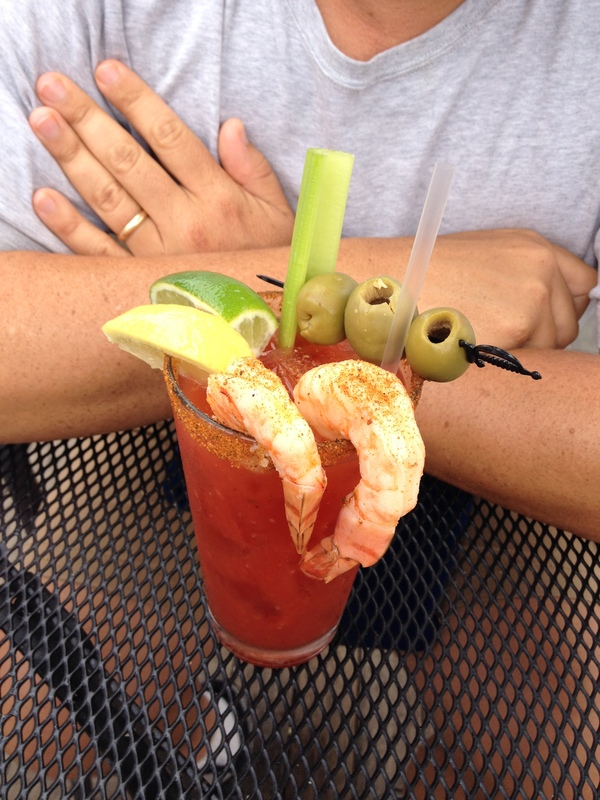 There was also this, the “Best Bloody Mary Evah.” A meal in itself. 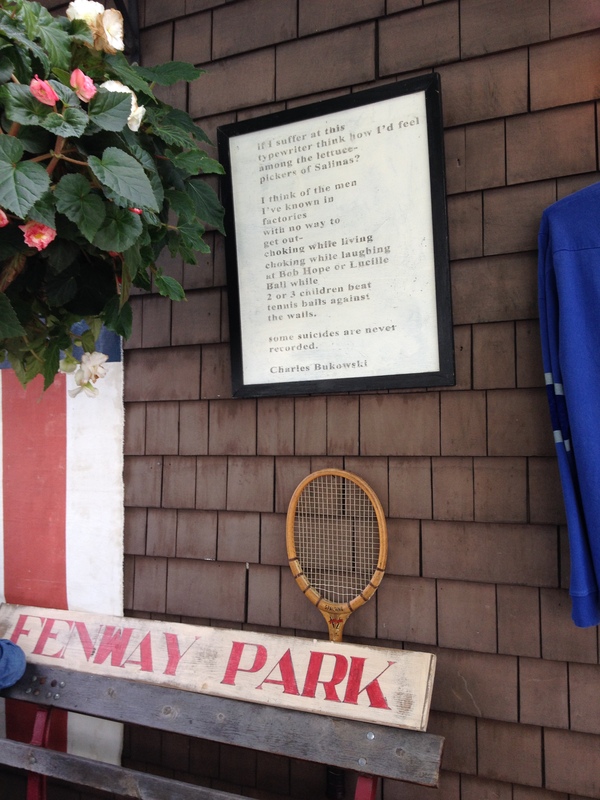 In addition to lovely food and views, Edgartown was charming, historic, high end, busy, and surprising — I never expected to see a Charles Bukowski poem welcoming shoppers into a preppy store. 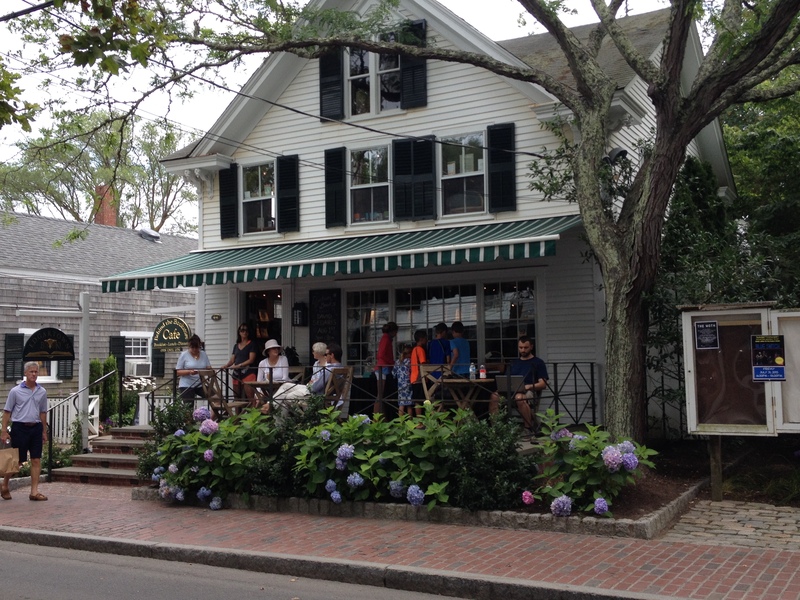 Another fun fact about Edgartown: When I first walked into Edgartown Books, a dozen people were lined up patiently waiting to buy their summer reading from booksellers May and Ann. This was a town to return to. 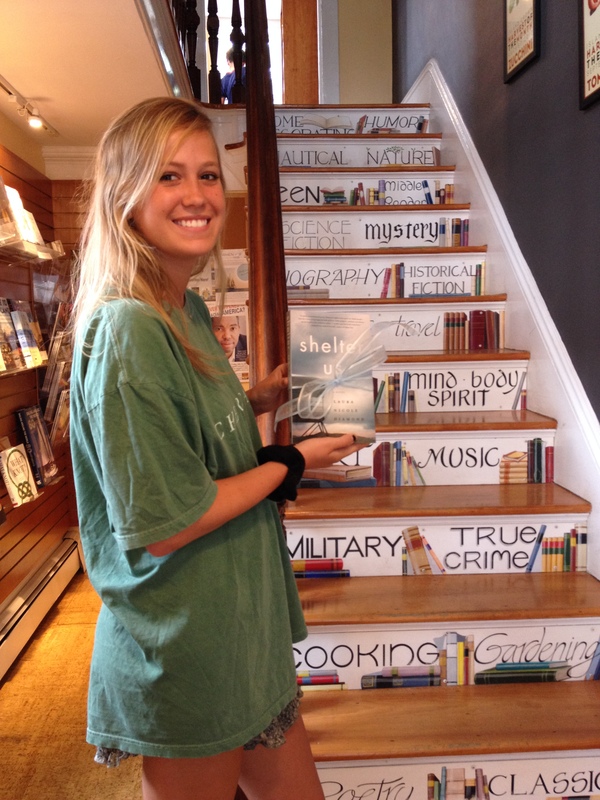 May (whose books I hope to be reading in the not-to-distant future) by the stairway to Edgartown Books’ second story. Then it was time to return. 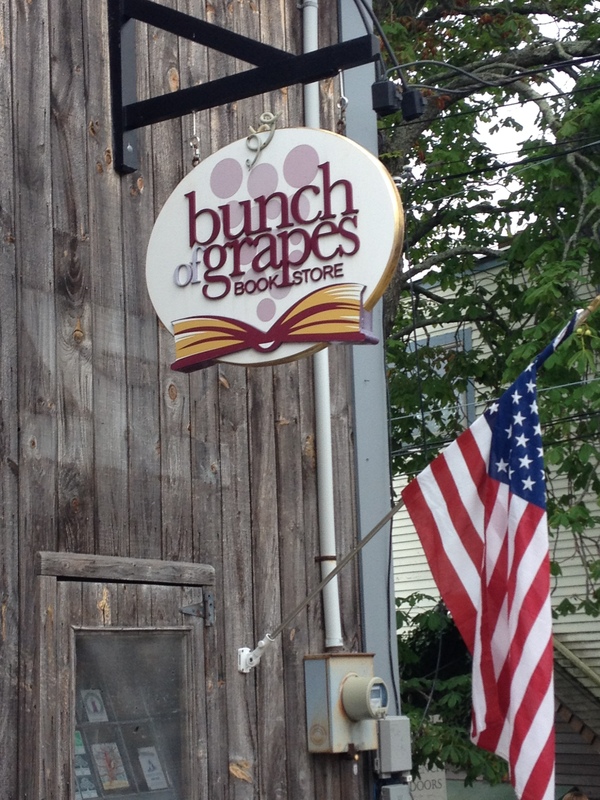 We rode seven miles to the town of Vineyard Haven, and said hello to the good people of Bunch of Grapes Bookstore before rushing to the dock for the five o’clock ferry. Booksellers were so busy helping so many customers at Bunch of Grapes, it was impossible to take a photo with them. Good problem. We queued up with the other cyclists, and sat on the top deck, accompanied back by the seagulls. This time they were hand fed by some passengers. 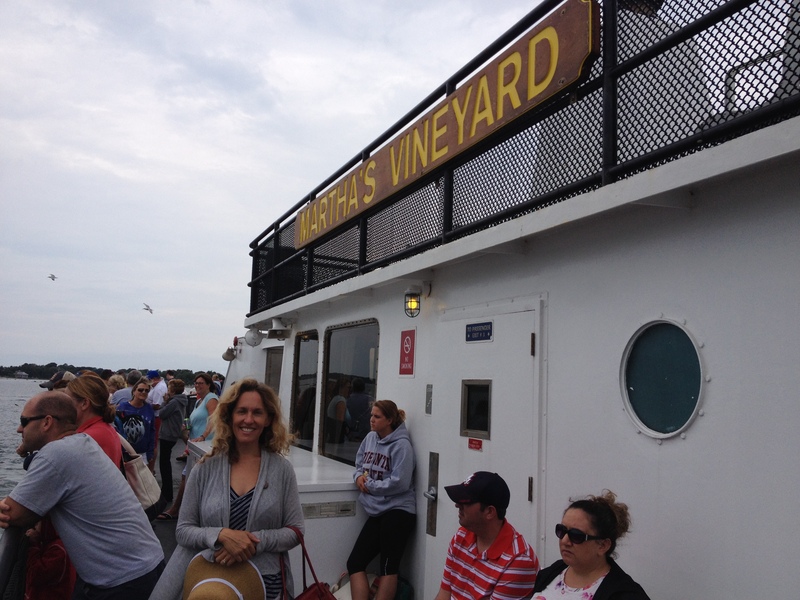 During our fleeting visit to Cape Cod, and today Martha’s Vineyard, I am trying to digest these places. I listen and watch, and fill in the blanks with conjecture: there are locals, there are summer people, there are regular weekenders, and there are folks like us — one-off visitors seeking a glimpse of the myth of The Cape, with less than a day to give the Vineyard. After the ferry delivers us, we return to the rented house in New Seabury and all is well. Harry Potter has commanded the day. Mystery still abounds, there is much still unexplained, and that’s okay. The last installment is coming.